Four recent ordinations in the Diocese of Saskatchewan were marked by reverent worship, firm exhortations to Gospel preaching—and a great deal of feasting. 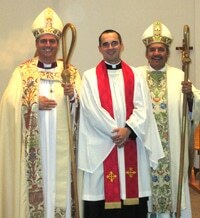 Christopher Dow was ordained on the Feast of St. Luke, October 18, 2013, at St. Mary’s Anglican Church in Birch Hills. Rev. 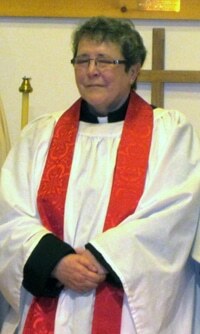 Dow, Rector of St. James, Muskoday, St. George’s Anglican/Zion Lutheran in Kinistino and St. Mary’s Birch Hills, began ministry in the parish on New Year’s Day, 2013. Over the following year, Chris and Amy became well integrated into the parish’s rural communities and the diocese, making the ordination celebration all the more meaningful. Parishioners from the parish’s 3 points attended and presented Chris with a gift of a chasuble and alb and all three congregations joined together to host a reception. Bishop Michael Hawkins and Bishop Adam Halkett conducted the Service of Ordination, along with clergy from Christopher Lake, Melfort, Tisdale and Prince Albert participating in the service. This theme of Gospel preaching and care was echoed on Thursday, Nov. 14 as the Rev. Lloyd Young was priested by the Bishop of Missinipi, Adam Halkett, at the Church of the Good Shepherd in Cumberland House First Nation. The Bishop of Saskatchewan, Michael Hawkins, celebrated Holy Communion. Fittingly, the Bishops decided to transfer from the previous day the commemoration of Charles Simeon, the nineteenth century evangelical Anglican preacher. Bishop Hawkins noted that Simeon was one of the founders of the Church Missionary Society (CMS), which began the mission in Cumberland House in the 1840s. After the service, a feast at the nearby Veterans Hall featured no fewer than five different meats, including local duck and moose. During the meal, Lloyd was presented with moccasins and other various gifts. The clergy who stayed overnight in Cumberland House enjoyed excellent hospitality at the Dayspring Bed & Breakfast, named after the verse from the Benedictus (Luke 1:78): “The day-spring from on high hath visited us.” This was the text of the first sermon ever heard in the Cree language by the people of Cumberland House, preached by CMS missionary Henry Budd on Christmas Day, 1850. Standing on the shoulders of evangelical luminaries such as Simeon and Budd, Lloyd will carry on the Lord’s mission to shine the light of the Gospel in Cumberland House. He does so in a continuing ministry partnership with Canon Park Buck, priest-in-charge. St. Christopher’s in Christopher Lake celebrated the ordination of The Rev. Pat Martin on November 15th, 2012. Bishop Hawkins, assisted by Bishop Halkett, officiated in a “traditional, impressive and beautiful” service. 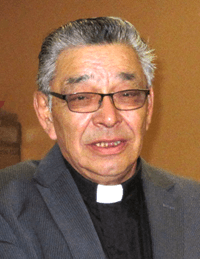 The congregation of 105 included Bishop Tom Morgan, Saskatoon, Bishop Arthurson, LaRonge, Lutheran and Roman Catholic guests, approximately 20 clergy from the Diocese of Saskatchewan, and members and friends of the congregation. Following the service, a reception was held in the parish hall. Gifts were presented by her fellow clergy and the church wardens on behalf of the congregation. The business of serving Christ and his Church is the vocation of The Rev. Morris McKenzie, described as an “active lay reader and deacon who dedicates himself to the spiritual needs of the community.” McKenzie’s priesting was held on Sept. 25, 2013 in the picturesque and remote community of Stanley Mission. Morris and his wife Sarah have four children and his hobbies include walking, music, hockey and woodworking. This was the first Ordination performed by the new Indigenous Bishop, Adam Halkett. 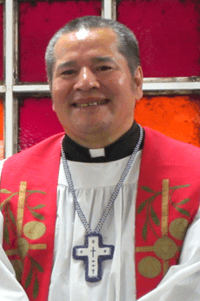 Chief Tammy Cook- Searson of the Lac La Ronge Indian Band told the congregation how pleased she was to see the two bishops working together “Mamuwe isi Miywachimowin” (“Together in the Gospel”). The collection, totaling $275, taken at the service, was given to Mamuwe for the position of Indigenous Bishop. And, of course, a delicious feast was enjoyed by all following the service. With files from the Diocese of SK, Parish Communications, & The Rev. Chris Dow.